How do you describe a perfect day? For one thing, you don’t take many pictures because you are too busy absorbing it all. Sorry about that. 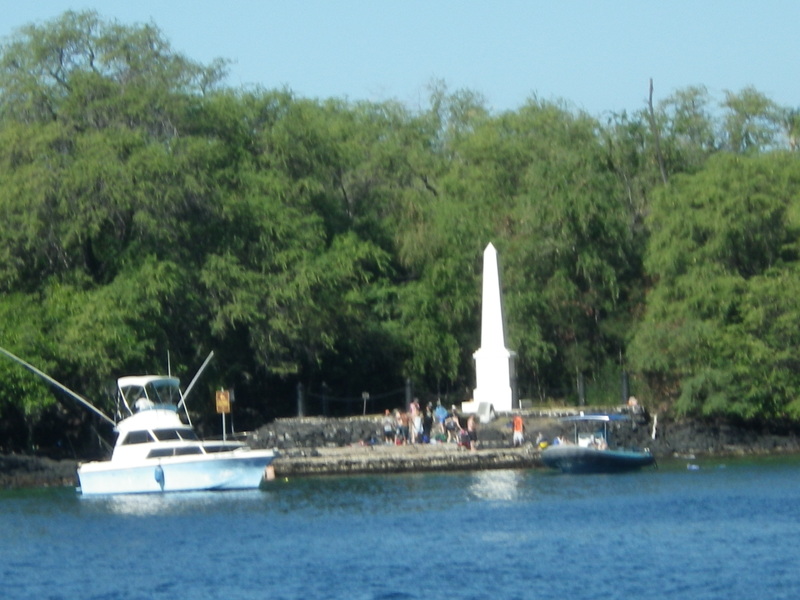 The perfect day began with a snorkel trip over to the Captain Cook monument in Kealakekua Bay. Here’s the monument. Eight years ago, you could just rent a kayak and paddle over, snorkel and paddle on back. It got a little out of hand and the natural setting was beginning to look rather unnatural. So, permits are now required. And guides (I believe) and snorkel ships of different sizes and only a certain number a day. There’s also a residential pod of spinner dolphins who wish to rest during the day after a night of hunting and dining. People wanting to experience a magical dolphin encounter were disturbing their sleep. 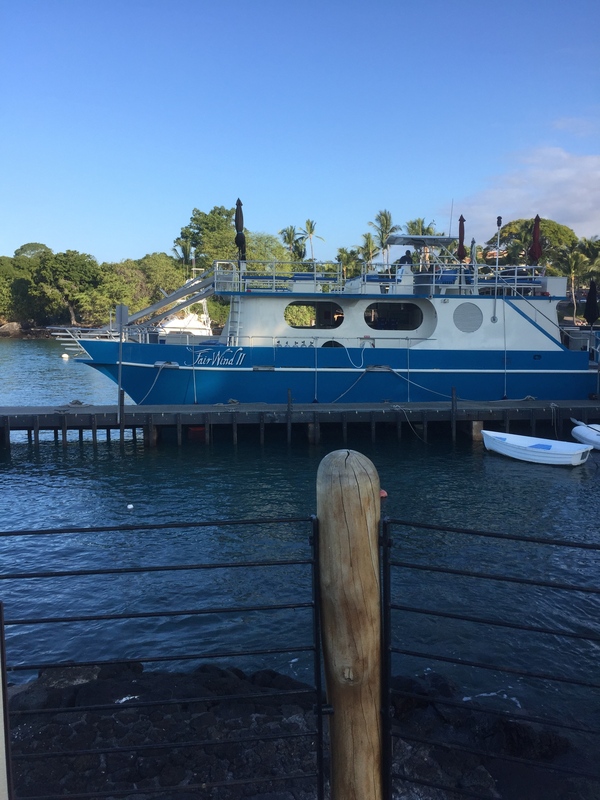 Our snorkel boat took us over to look at them, but respectfully kept its distance. As were other boats. I’m sure they were disturbed anyway. All that motorboat sound. But, they still stayed there and rested. If it gets too much, they leave. 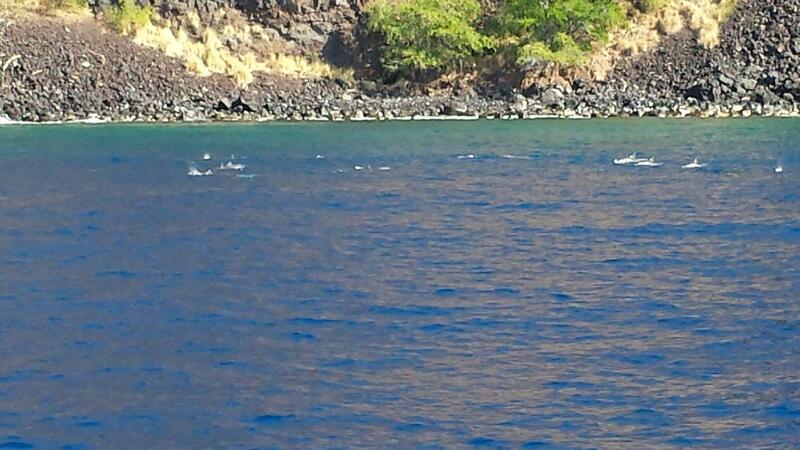 There are “Swim with the Wild Dolphins” tours. We noticed those boats arriving as we were pulling out, so at least the spinners get a little shut eye. And that’s how they sleep: each half of their brain gets a chance to sleep. If both halves slept at the same time, they’d stop breathing and drown. There’s a fun fact for you! 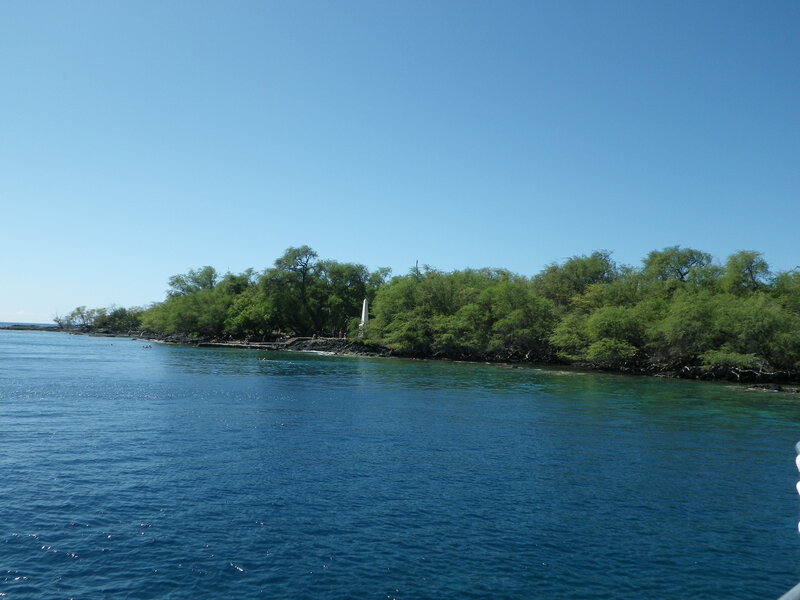 Anyway, we saw whales and dolphins and dove into the deep blue to see the little fishes darting in and out of the coral. If you were a fish, wouldn’t you be disturbed if a huge hulking shape came lurking from above? Wouldn’t you think it a very good idea to hide within the coral until those thrashing hulking shapes disappeared? If you want to see the more reserved fish specimen, do two things: swim a little bit away from the other hulking shapes and be as still as possible. Splashing is a no-no. Gliding is a yes-yes. Normally, Mr. Al and I stay away from the large touristy establishments. 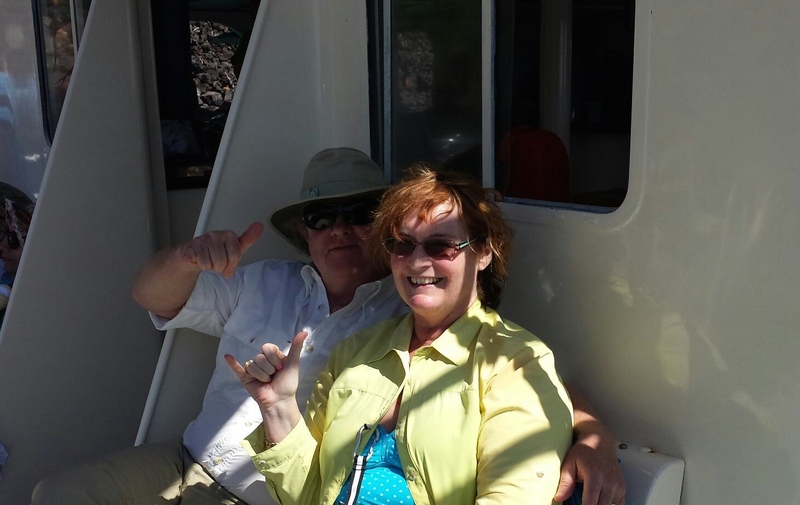 But this catamaran trip was fun. We found a nook at the bow and settled in. Here were are in our nook on the way home. The peeps took good care of everyone. Lunch was great. I’d not had a burger and chips meal for a long time. Something about a grilled meal in the out-of-doors. Yum! 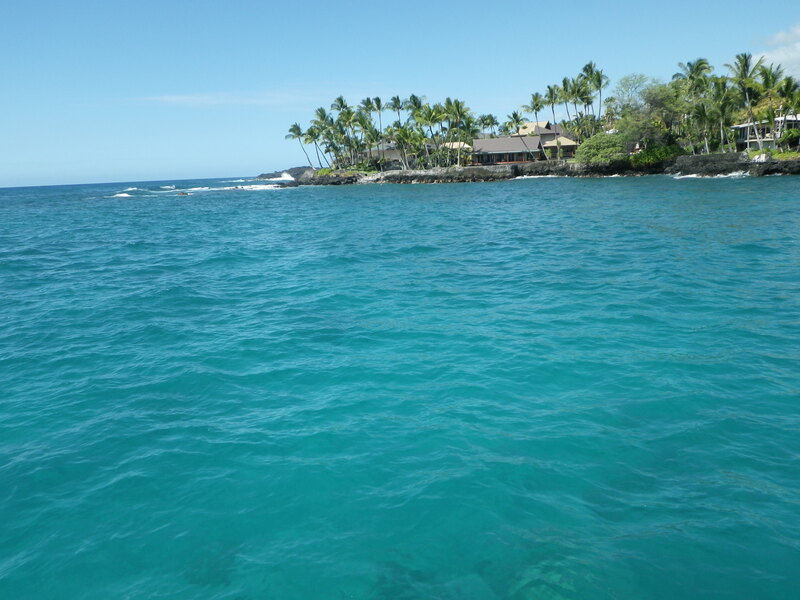 More snorkeling after lunch, more whale watching on the way home. Dinner was at Peuo’s Osteria in Waikoloa Village. 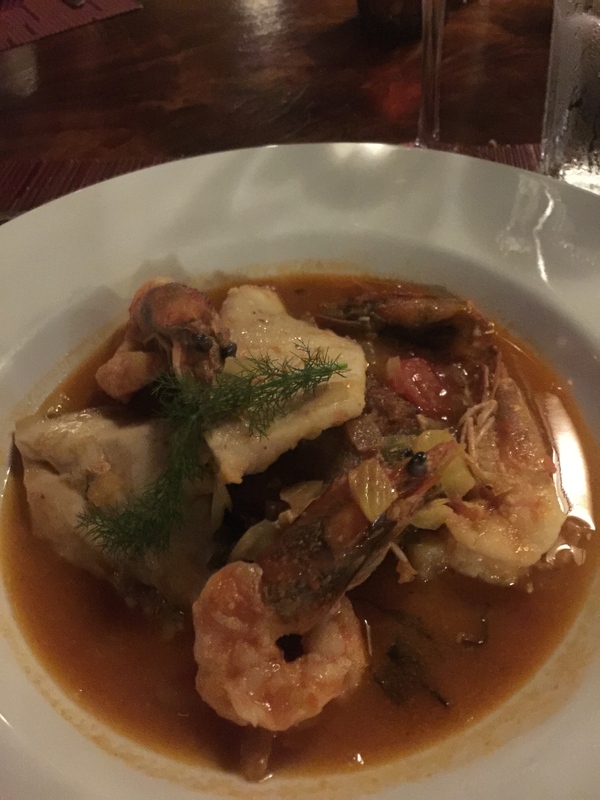 The chef was once a Four Season’s head chef who wanted to create his own Italian restaurant. This bowl of “Crazy Water” is the most delicious and aromatic creation I’ve tasted in a long time. It featured the catch of the day (an unpronounceable fish) and shrimp on a potato and spinach patty. Definitely go there, order this and use a spoon. Definitely make reservations, too. I owe you peeps a lot of pictures, I know. Day before yesterday was a whale watch. I took a little movie that needs editing. Our guest, will be leaving tomorrow and the pace will slacken. Mr. Al and I will be doing more non-group things. Our pocket books are a tad pinched with all these tours and whatnots. (Yes, the dreaded whatnots. )We are signed up for a tour to the star gazing facilities on top of the mountain, here. But that’s it. Well, maybe just one more whatnot. Okay, ya finally got me. I want this day, please. Up to and including dinner. Sounds fabulous. But stargazing is tempting too. Sure am enjoying your vacation! I’m enjoying it, too! (Heehee). The moon is big, lovely and bright. Hopefully she won’t interfere too much with stargazing.